Young Lewis (Owen Vaccaro) has just been orphaned after his parents died in a car crash. 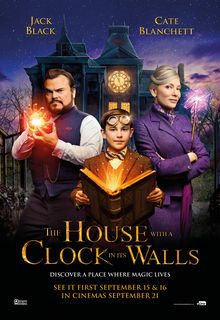 He moves in with his Uncle Jonathan (Jack Black), a weird but friendly larger than life character who lives in a beautiful, strangely appointed, Victorian house full of clocks. Jonathan shares the house with Florence (Cate Blanchett), with whom he shares a deep friendship and a love of verbal insults. But Jonathan harbours a secret. He is a warlock and Florence is a witch and Jonathan is obsessed with finding a powerful clock that has been hidden somewhere in the house by his deceased friend Isaac (Kyle MacLachlan). But what is the clock for? Owen teams up with Jonathan and Florence to solve the mystery. Based on the novel by John Bellairs, this feels like a sub-Harry Potter rip-off but, given Bellairs’ book was first published in 1973, a full 17 years before J.K. Rowling had even had a first thought about anything to do with Hogwarts, the influences may be in reverse. Going backwards and spinning the natural order of things upside-down is the order of the day in this movie. Despite the abundance of clocks, the most important one is MacLachlan’s terrible creation which can turn the hand of time backwards, the objective being to stop all humans from ever being born. The school bully (Sunny Suljic) has a broken arm and has been side-lined by his pals. He takes timid, out-of-place Owen under his wing and the two become firm friends. The adults are the oddest characters. With an infantile father figure (Black) who likes to play the saxophone – badly – in the wee small hours and the prim, schoolmarmish ‘aunt-type’ (Blanchett) actually a warm and empathic care-giver, Owen’s preference for wearing racing goggles is the most normal member of his new family unit. Unlike the pedantic, detail obsessed, uptight and unfunny Harry Potter series, House with… is riotously silly. A bit too silly at times but it’s very enjoyable silliness all the same. It helps that the generally silly but always hugely watchable Black is the one in charge of the laughs in the type of film he usually has wrapped around his little finger. Not so here as his surprising, bewitching co-star is the usually poised and sleek Blanchett. Smooth cheeked and grey haired, she lets that hair down and goes all out camp. Clearly, the two actors enjoyed working together and with the addition of the confident young actor Vaccaro (Daddy’s Home, 2015) keeping up with these veteran screen-stealers, the good natured, family friendly-larks are assured throughout. Word of mention must also go to production designer Jon Hutman for a superbly realised ‘gothic’ house and to Marlene Stewart for the beautiful costuming. Director: Eli Roth.1hr 45 mins/105 mins. Dreamworks/Amblin/Mythology Entertainment (12a). Producers: Eric Kripke, James Vanderbilt. Jack Black, Cate Blanchett, Owen Vaccaro, Kyle MacLachlan, Renee Elise Goldsberry, Colleen Camp, Sunny Suljic, Lorenza Izzo, Braxton Bjerken, Vanessa Anne Williams, Eli Roth. Venom (2018). 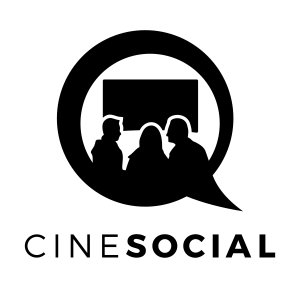 We’re going out on a limb – this comic-based film isn’t bad!